Bad player or no player? Which is worst? Ever notice that people complain about being down 200 hive but if your short a player no one cares? Imagine a 8v9 game with 1800 hive avg, the team with 8 effectively has a 0 hive player so their acctual hive score is 1600. Even worst when your down a player because someone good left so it showes 1700 vs 1800 BUT its really closer to 1500vs1800. Still wishing that the end of round stats had a skill and player count chart. The following link shows a function in wolframalpha that shows the probability of winning given a hive skill difference. A 200 hive skill difference will put the down team at about a 10% chance of winning, at least if I am reading this correctly. Not quite what you are looking for, but related. Edit: The above function is something Moultono did, not me. I only linked his work. 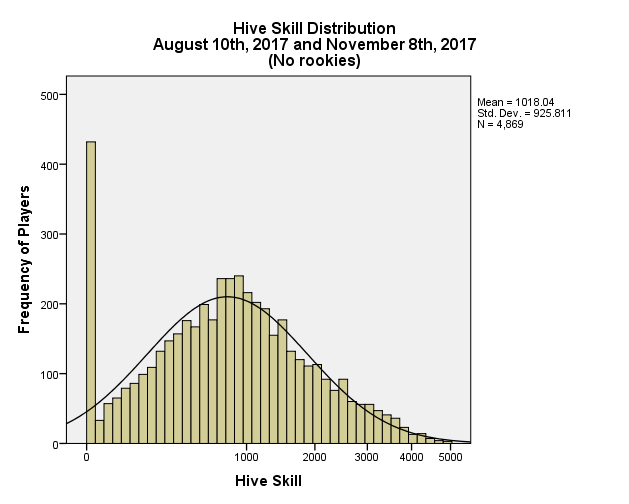 The "hive skill" calculations that are currently in use assume an equal player count. Nordic, have I ever told you I love you and your data? Other than that, an empty slot has the potential to be filled by a good player. A player slot filled by a bad player does not. And bad players can make things worse. Ever had rounds where marines would get up three phase gates, then would clump up around the one in the front and keep suciding into a nearby alien occupied room while aliens took the rest of the map? Of course you did. It takes bad players to keep the momentum of these plays up, and that's a bad thing. I'd rather have one player less overall to make these kinds of situations more obviously hopeless so maybe the rest of the team will catch on. It's also less frustrating to look at five useless players on your team instead of six. a low skill player is better than no player. If we play 9v9 with a low skill player the team elo will drop and therefor hive predicts a different outcome. with 8v9 the teamskill of the 8 member team is higher even though the team is not stronger and therefor hive would predict a bigger likelyhood of the 8 team winning which would mean that the players on that team lose more elo. Bad player because the no player spot can be filled by someone who isn't bad. Why no comparison between AFK and bad player, also how bad is this hypothetical player we're talking about here!? Even without the possibility of a good player coming in, a bad player can clog your spawn queue, block your shots/movement and expose your location. What do you get from a bad player? A meat shield who probably also doesn't weld? an empty slot has the potential to be filled by a good player. A player slot filled by a bad player does not. And bad players can make things worse. ^ This is the kind of mentality that leads to innocent people (mostly rookies) being harassed and/or votekicked just because they're a bad player. An empty slot is an empty slot, and has just as much potential to be filled by a bad player as by a good one. 7 minutes later the game ends with a Marine victory and people on Alien will point to hive and go "we lost because we were down 200 hivescore the whole game!!!!" I second that wish. More stats is always nice. There's a huge difference between a bad player and someone who just stands in the same spot accomplishing nothing all game trolling their team, bad players aren't kicked, they get yelled at with the proper information to not be bad in that particular scenario. Trolls who do nothing on propose because they feel like they "don't have to do what you tell me" and cripple their team (in a heavily TEAMWORK oriented game) get kicked. Calling someone "bad" is not harassment, sorry if you feel like it is. If your sensitive enough to perceive smack/trash talk as harassment internet gaming is not for you. Even after they leave rookie status, the so called bad players greatly outnumber the so called good players. A bad player is also a highly subjective term. I still consider myself a bad player even though I am technically far above average. How many are there in that 4-5,000 range? If its 8 marines vs 9 aliens. Then one alien wont spawn. That alien could be their best player or worst. Also the new player filling the slot could be better or worse. Players leaving multiplayer games is a tale as old as time. I think auto balance only kicks in if the difference is two players or more, but I'm not sure. Used to be that way, anyway. It is or was server configured. The default is or was two. There are currently 91 players above 4000. There are 5 players above 5000, although Novorei doesn't count because he abused the Hive 1 system to get there. It's amazing seeing the degree to which those players can affect a game and carry the team. Ah ok. server admins should change it to one. That way it always stay even with one person queuing in spawn till one of their teammates dies or another player joins. People join and leave any multiplayer game. Which has a negative impact on the said game. And while some games “play now” button would push similar skill players into that empty player slot, NS2 doesn't have enough players clicking on the play now button simultaneously to find an equal level player to put into the slot. So it just puts anyone in that hits the button. Otherwise you would be waiting forever to fill the void with an equal skill player from the person who left. So an empty slot actually has a higher chance of being filled by a bad player. Of course there is, but we're not talking about trolls here, we're talking about bad players. I never even hinted that it was.. that would be ridiculous. Raging at someone who failed to kill an injured Fade by telling them to uninstall and kill themselves, that is harassment. Using racial slurs to insult someone is harassment, trying to get them kicked by lying and saying they're doing something they aren't, is harassment. Just the other day I saw a rookie get kicked and he wasn't doing anything wrong. (from what I saw he spent most of his time attacking their back res towers) Some elitist jerk just got mad we were losing and decided to blame the rookie. They started by yelling at/insulting them, then they started throwing up vote kicks and lying by saying "afk"... Then when I pointed out that they were not afk, the jerk turned around and lied again by saying "he's been sitting in a corner doing nothing all game" Before I could type out "no he isn't, he's been attacking their res" the vote passed and the rookie was gone. Really i just got annoyed when people were complaining about skill balance when The team with the higher skill was short a player... if they had averaged in a imaginary 500 skill player it would have been even. It's sad when a player with less than 100 hours gets kicked for "trolling" when they didn't do anything even remotely wrong. since I wasn't there I don't know, but in my point of view you lost your credibility for those statements long time ago. Can't you feel the chills or already hear the snickering while writing that...? It is server configured. The default is two. I thought auto balance was disabled a while back? Just out of curiosity I'd love to know how long ago this was, and whether or not I was on Marine. Doesn't mean I'm wrong though. The # of people who abuse the votekick system and lie to kick "bad" players is much much higher than anyone around here will admit. Some food for thought, if you happened to be one of the 10 people on the other team who voted yes, you would've left that game thinking that a troublemaking troll just got rightfully kicked, when in fact it was a bad player being harassed right under your nose without you ever realizing it. You apparently missed the significance of the quotes... I merely used the word "competitive" for lack of a better term. Their rules did make it more of a serious "competitive" atmosphere than what you find in the typical pub server after all. I certainly didn't mean to imply that TGNS was an actual competitive server.